Yep, that’s me this Christmas. I don’t know what it is. Maybe burn-out or overwhelmed or that darn TV in our bedroom. We finally moved over to the Darkside and put a TV in our bedroom. I hate to say it, but crap, I love it. Sitting in bed and knitting until 2am is addicting. Sewing in the dark, cold living room- not so much. Each only took one day to knit and the boys love them. Augie even wore his to bed the first night. I think it’s the ear-flaps. Who doesn’t love those? Up next, fingerless gloves. No, they aren’t a part of a christmas present and yes, they are taking longer to knit, but who cares? 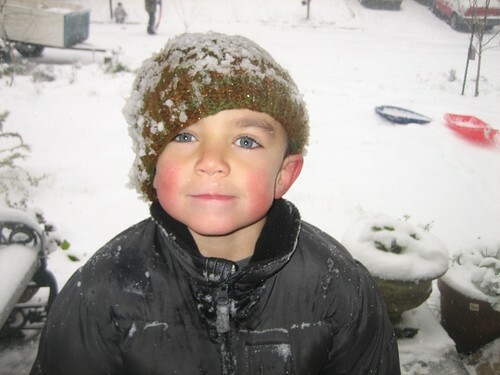 It’s snowing, I’m warm and this will be the first white Christmas that I can remember. I can’t complain. 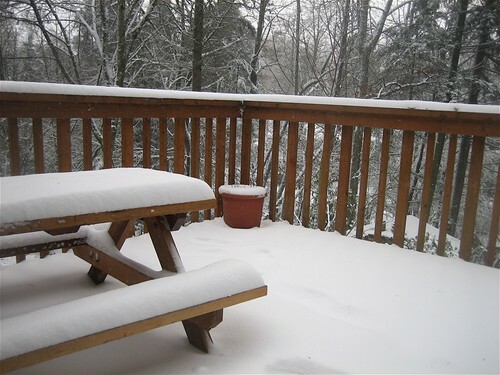 Augie got down on his knees in thanks this morning as the white stuff started to fly. It doesn’t take much to make them happy. It’s really coming down now and is expected to last a while. 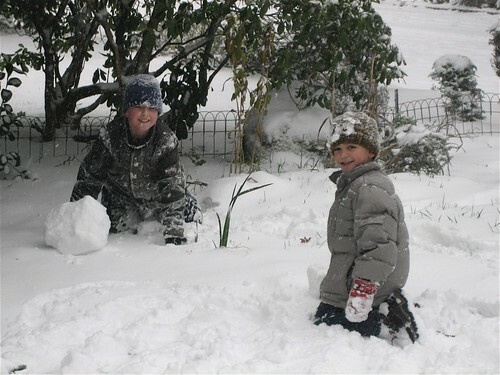 Snow makes this family very happy since we all don’t have to work if the schools are shut down. 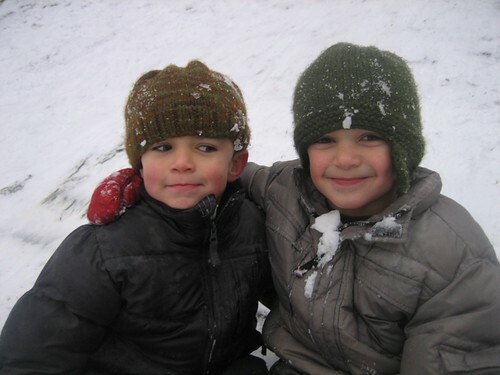 Yippee for snow days! My goodness I totally LOVE these! 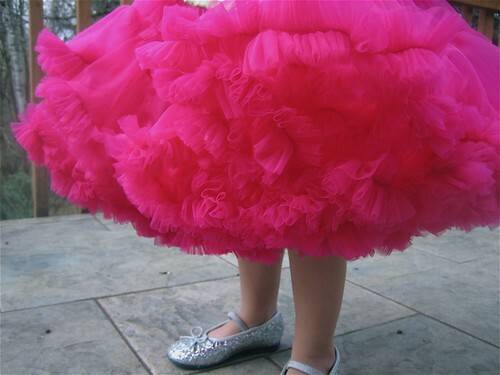 Pettiskirts are light, full of fluff and can twirl like no other. Yes! I made this. I was prepared for the worst and heard horror stories. I read of people who didn’t and wouldn’t even try to make these, but would spend $80 for one. But. I wanted one. I wanted many. I knew I couldn’t afford them so when I found the fabric (you have to use nylon chiffon) for only $1.50/yd, I took the leap. People! It’s easy. Scratch that. I mean it’s easy if you have the right equipment. I have a gathering foot which works very well on my machine. The hardest part is figuring out how many yards you need because at $18 for shipping & handling , you don’t want to order more anytime soon. I used about 7 yrds of nylon chiffon and 1/4 yrd of silk charmuse. I really don’t think you have to use the silky stuff. It depends on the look you want, I guess. I think a cute cotton print would be just as pretty. My daughter is a small 2T so for larger sizes I would figure for more. There are two layers of chiffon and silky stuff. 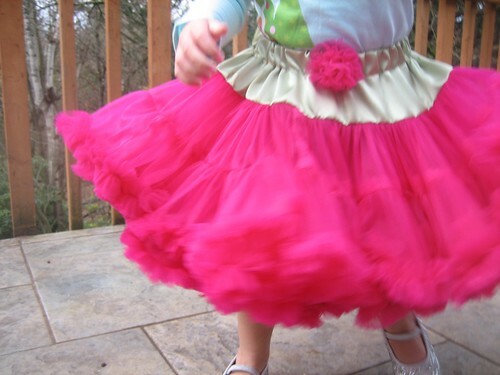 The skirt has four tiers. 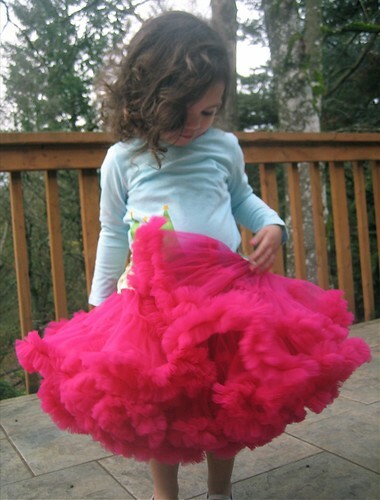 Top tier is the silky, the next two are the chiffon loosely gathered, then the bottom layer is called ruffle fluff. A good name I think. I wanted the skirt to be about 11″ long. I cut 18 strips (from selvage to selvage which is 54″) 5″ wide. That’s eighteen 5″ x 54″ strips. For the ruffle fluff, I cut 90 (!!!) 2″ x 54″ strips. My gathering foot gathers the 54″ strip down to 8″ which is why you need 90 strips! I followed the directions from the forum post closely, but did sew the skirt from the bottom up starting with the ruffle fluff. Overall, a fun and darn cute project which I can’t wait to sew again. 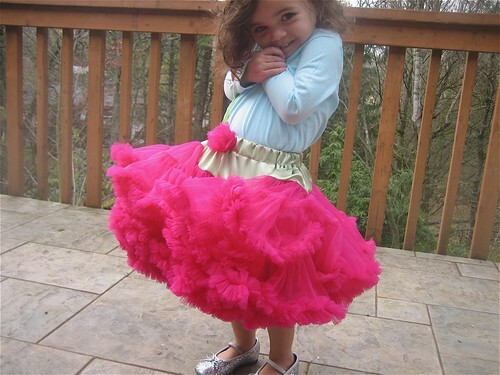 Really, I loved making this and really really love the pettiskirt. If you want to try one, let me know if you have any questions. I’d be happy to help you whip one up! Ms O’s skirt made with this great Oliver & S free pattern. 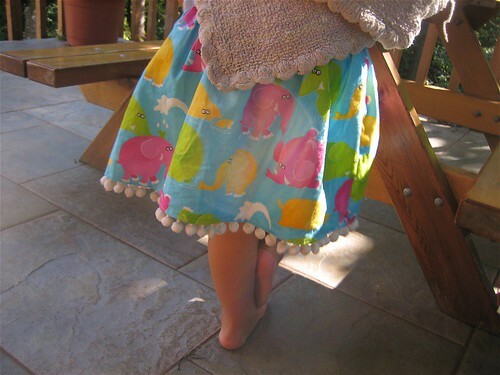 I love this simple idea and she adores this skirt. Today she found my pink pom-pom stash so I guess I’ll be making her something soon with more of this great stuff. I think I may try some pants since these are too cute. BTW- it’s really easy to add these to any hem. They come attached to a flat rope-like ribbon that is easy to sew through, but at $4.99/yd I can’t buy as much as I’d like. I’ve also made a two-layered version of this skirt which I think I like more, but don’t have any photos to share yet. Okay, they are a little funky and people still can’t get over why I have curtains hanging in my doorway, but I think they are wonderful. 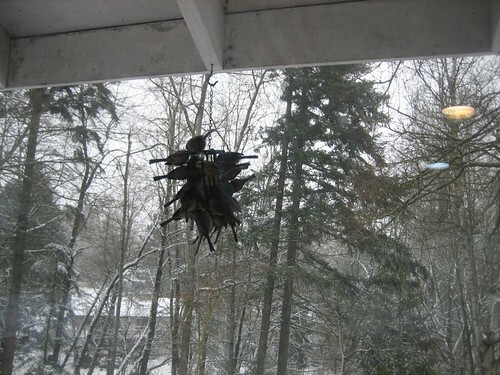 These flutter in the wind, bring cheer to my doorway, and keep the peepers from peeking just as I imagined they would. 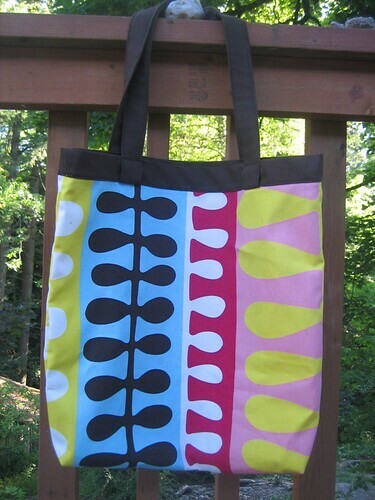 And lastly, more totes. These are by far my favorite. 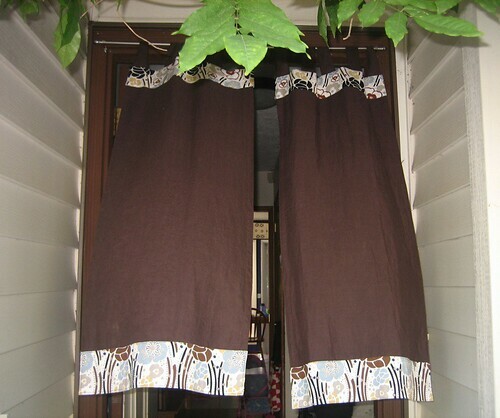 I’m sure you all recognize the fabric which are Ikea curtains, but I added brown canvas to the top hem and handles. I also made the handles a little longer than in my tutorial and the hem has nice hidden seams which makes the tote look tidy. All these summer pictures are making me wish for those warm days again. Currently it’s raining pouring outside and I’m under a yet-to-be-constructed fleece blanket.